As I mentioned in my review of the Meiji Rich Matcha bar, Meiji is the authority on matcha chocolate. 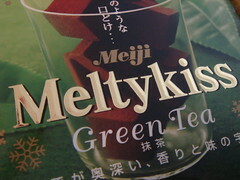 Matcha Meltykiss (or Meltyblend, as I think it's now called) is the buttery, sweet epitome of matcha chocolate. It's another candy that seems to only be out in winter, but it's worth the wait. Each box contains plenty of individually wrapped chocolate cubes. To be more specific, they are matcha white chocolate cubes coated in chocolate with a powdery cocoa finish. Even though they are small, you'll want to savor them, believe me. The inner matcha white chocolate is delightfully smooth, silky, buttery, and rich.